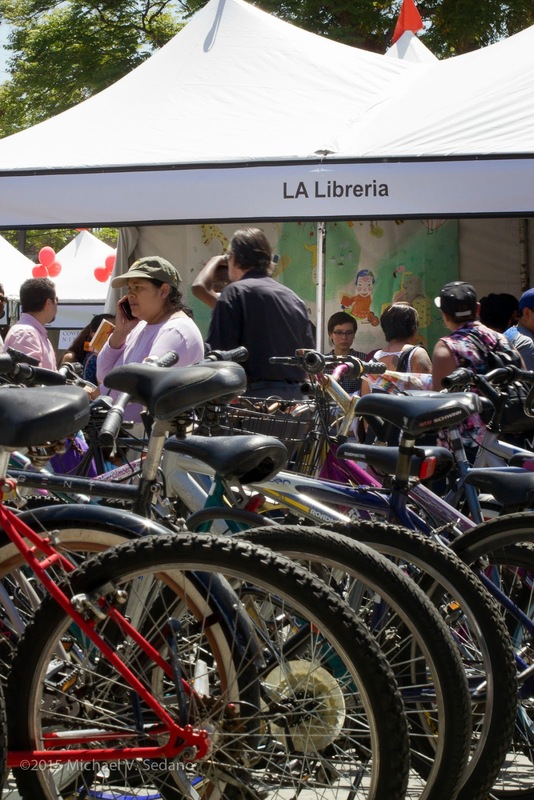 La Bloga: Times Book Fest. NaPoMo On-line Floricanto. 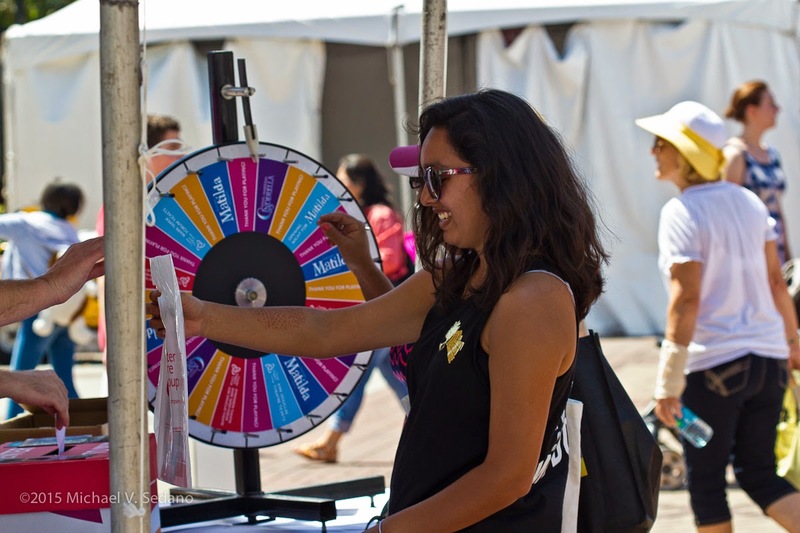 Three kinds of organizations populate the weekend tent city that springs up on the University of Southern California campus when USC hosts the Los Angeles Times Festival of Books every Spring: commercial and community interests, publishers, and self-publishing enterprises. Together they provide a snapshot of the reading public and industries serving them. 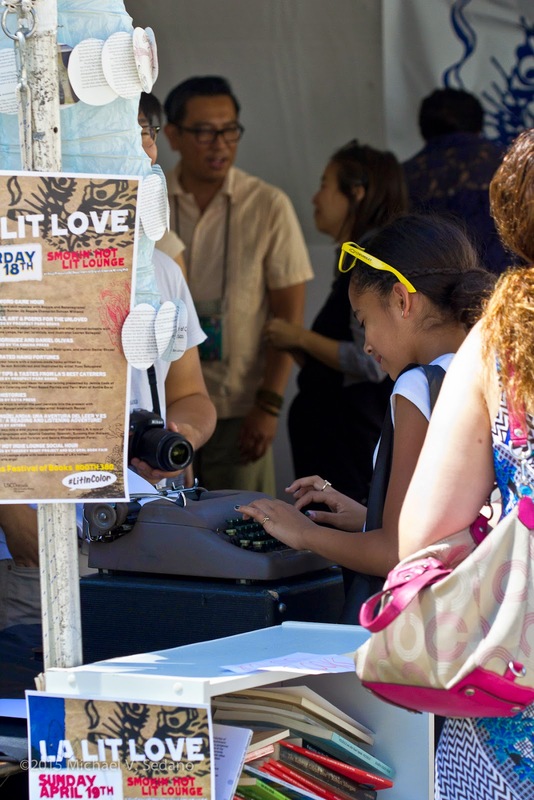 This annual gigantic literary trade show provides a good workout, even on the flat campus. I visit only a smattering of activities and cover two miles. with lots of stops. The festival makes for an engaging day of people-watching, chatting up visitors and authors, listening to soft-sell pitches from self-publishing businesses. Non-book exhibitors buy big spaces. C-Span television had hundreds of square feet along with a mammoth mobile studio. I suspect USC’s Keck Medical Center got in free. The Health and Wellness Pavilion offered take-one folders and free sign-ups to talk to a doctor, be screened for glucose, skin and breast cancer, sleep apnea. Everybody here reads and breathes, so I hope Keck got in free. The book fest is not cheap for exhibitors squeezed into USC’s ample green spaces and broad cement promenades. The smallest space at 10’ x 10’ costs $1150, the largest booths, 20’ x 20’, represent an investment of $3600 for two days in front of an audience. Marketing is the key to any book’s success, and numerous writers demonstrated their commitment to their art, buying boothspace and setting up displays. Many do not take the next step: work the booth. Greet and meet people, draw their attention to your book, sell a copy and autograph your work. Go home satisfied and not have to schlep those books home. Signage and long rows of white tents force exhibitors to jazz up the booth to bring people in. Some bring in visitors by offering freebies or a spin on a roulette wheel. Buying booth space doesn't guarantee people will stop and talk. It’s the Achilles’ Heel of all trade shows. “Michael Sedano” a woman calls as I approach the Cinco Puntos Press booth. It’s a prime corner on the walkway toward the Poetry Stage, my destination today. Désirée Zamorano, whose The Amado Women is a 2014 title from Cinco Puntos Press, chats until a visitor leans across a table with a question and I head downrange. There’s a plaque honoring Cesar Chávez in the verdant dell between the Annenberg School for Communication, and Taper Hall of Humanties née Founders Hall. It’s the right spot for poetrylandia. The speech program in Founders traced its academic traditions to Aristotle and Plato. Annenberg began with Information Industry studies with a distinct futurist orientation. The two programs reflect a continuity akin to reading classic poetry and spoken word poetry. We won't argue a distinction. Visitors to poetrylandia had a chance to savor both outside the GetLit booth and inside Kaya Press' booth. Miriam Sachs stands near the GetLit booth where those Poet tee shirts are on sale, together with details on doing slam poetry competitively. She stands in a semi-shady place to perform a pair of poems. It’s the format of the upcoming GetLit Classic Poetry Slam. Sachs recites a piece by e.e.cummings before transitioning into her own reponse poem to cummings’. The linked recitation creates an entertaining style for oral interpretation of literature and is the requirement in a 3-day competition upcoming. Writers who read their own stuff to audiences need to watch skilled performers like Sachs. Unamplified, she projects without shouting above the din of passersby and ambient sounds of this exciting place. Although performing in constricted space, she uses all of it with arm and full body gestures, straying from home base only a few steps. Energy and excitement flow from her presence and voice. I am surprised when the audience doesn’t stand whooping and cheering when she finishes, that’s how infectiously she performs. 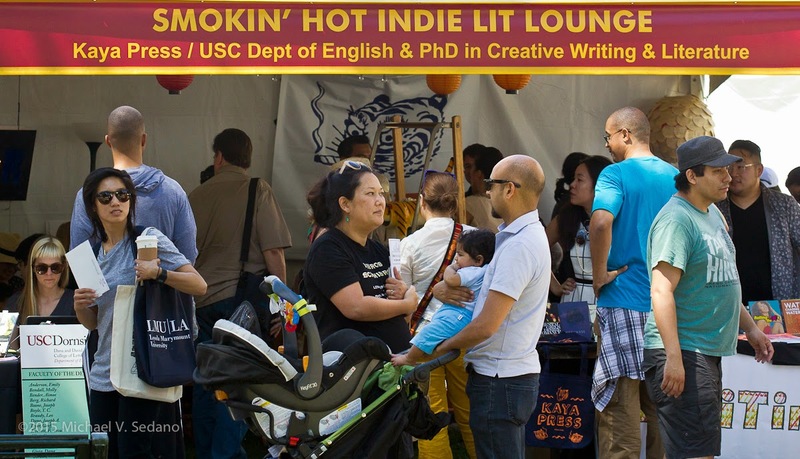 A wondrous contrast to the spoken word performer comes in Kaya Press’ Smokin’ Hot Indie Lit Lounge. 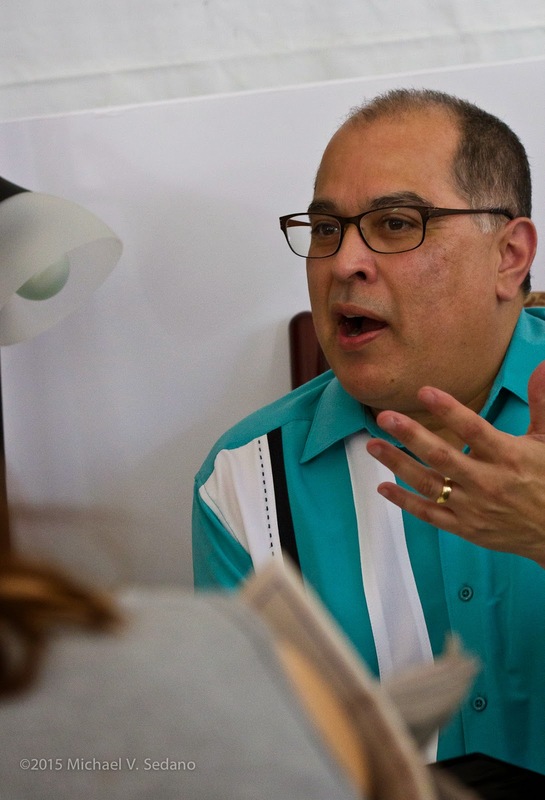 Seated in a close circle of chairs with rows of standing listeners behind, Daniel Olivas and Luis J. Rodriguez read with effective restraint, adapting to the situation and engaging the audience in repartée and a Q&A. Over in the children’s literature section, locutores on the massive Hoy stage work the sparsely filled seating area. In full sun, the venue doesn’t welcome loitering. 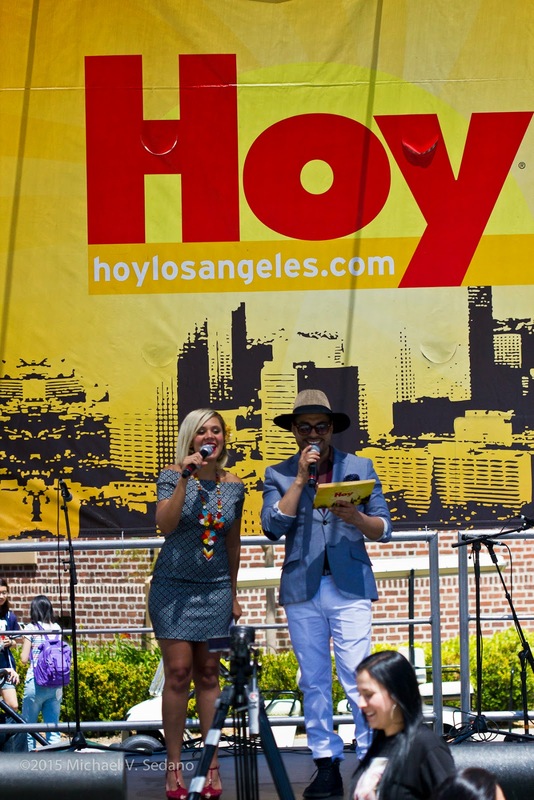 Which is too bad because the pair of emcees welcome a portavoz to pitch LéaLA, a Los Angeles extension of the Guadalajara Festival del Libro. Read more about LéaLA in this La Bloga report. 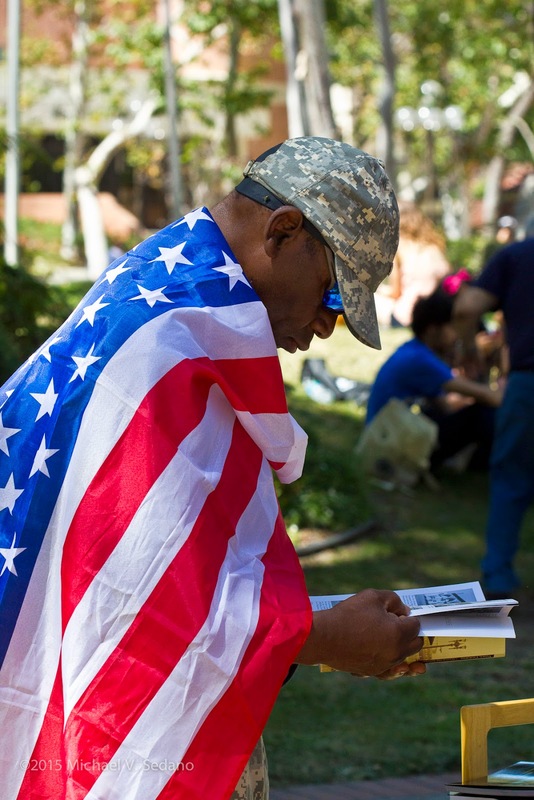 The entire LA Times Festival of Books is a rousing success, as an endeavor. The same won't be true for many who bought a space and use it ineffectively. Sitting behind a table eyeing the passing crowd, hoping for someone to stop, eager to engage when someone does, is not the way to work a trade show. Having interactive elements is a draw, but gimmicks aren’t required. C-SPAN was recording a Book Talk conversation while in other booths writers interviewed writers while the public watched intoxicated with the power of the press. One author with a unique approach--for this trade show--and a unique book is Dr. Jungmiwha Bullock. Am I Half Giraffe? comes in five languages, French, Spanish, Korean, and Afrikaans, on the same pages. 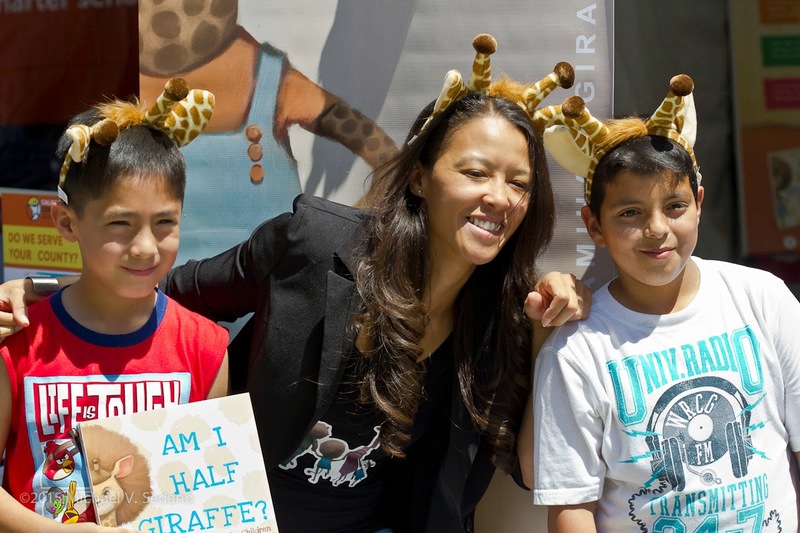 Bullock stands in front of her table in the aisle, invites attention by donning giraffe horns and posing for a photograph with her visitors holding that book. She's brought a pair of her students but needs another person to help out with waiting parents. Self-publishing companies I visited included iUniverse, Biting Duck Press, and Author Solutions. A Penguin/Random House operation, Author Solutions has a major presence with a double row of booths. I walk around them twice to be sure. I hadn’t heard of them. I stop at their first booth, worked by sales staff. “If this is author solutions, what is the author problem?” The answer I had to probe for was one of a series of “packages” from training to editing to printing to marketing to author signings. Indeed, up one side and down the other side of the double row of tents, authors sit with their books stacked, a cover on easels or a broadside. Mostly the authors sit there and look up expectantly as people shuffle past reading the title. Inspired to write, publish, and get a book signing through this company, only a few feel inspired to do something about it. All gladly answer questions, but only a few authors actively work the crowd. One has family passing out color glossy fliers that probably cost a nickel each. Gente have come to explore books so she gets a welcoming response from numerous visitors who take a flyer. The spirit and creativity of independent publisher Kaya Press, together with the spirit and energy of Writ Large Press’ Jessica Ceballos, exemplifies what is best about a book fair. At its heart, the booth celebrates literacy in every breath, from poetry readings to the constant background clicks of typewriters. Like all the other tables along the paths, shiny provocative books and objects cover horizontal surfaces. Inside, carpet covers the lawn, chairs and a sofa bound the rug, Kaya Press’ twist-smoking cartoon cat looks out from a banner behind the performers’ seats. 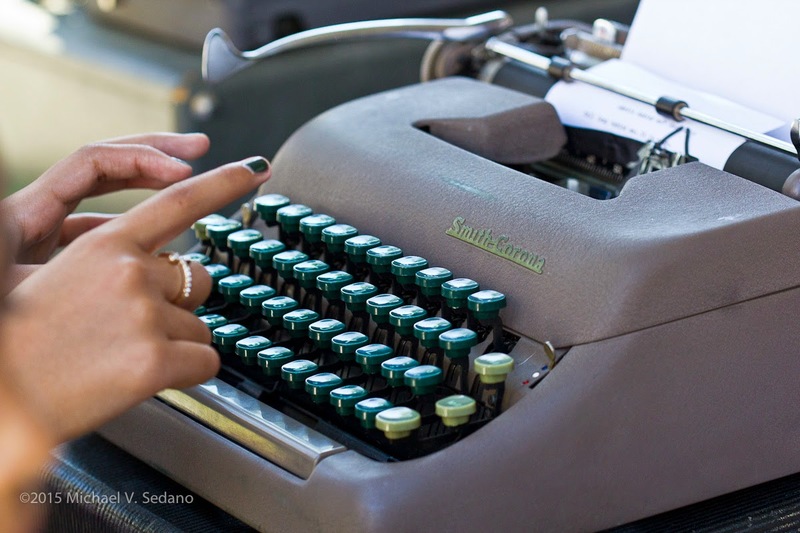 On the outside, manual typewriters and blank paper encourage people to stop. Lots of younger people ask questions about the ancient technology. Engaging guides explain operation and gently coax reluctant kids to start typing and make their own book. Hard return. Kaya Press’ booth hosts pregnant women, toddlers in strollers, old guys with cameras, readers all and of all persuasions. The experience of the poetry reading in the tent is like a virtuoso Trio in a living room. You can hear the cellist breathe, get a close look at the pianist’s fingers, watch the players’ eyes in mute communication. Instead of music we have poetry. 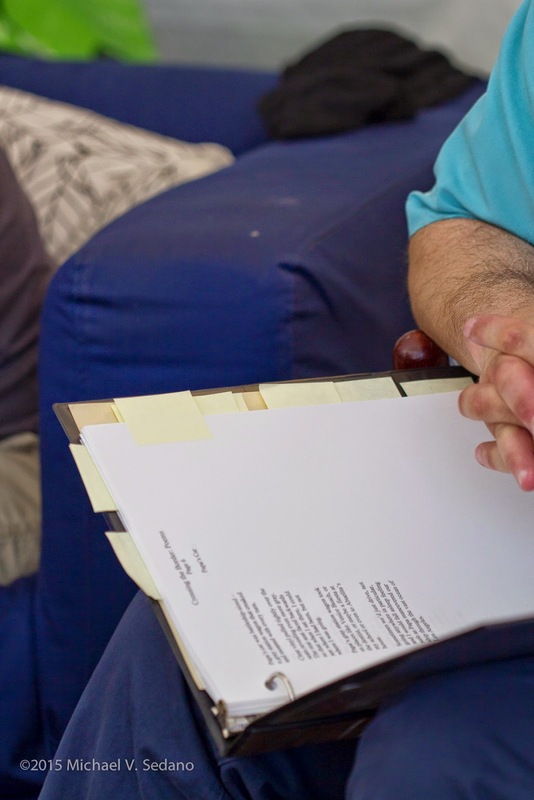 Smokin’ hot experience with the poet, words and gestures and inflections, listeners nodding understanding, smiling in the moment, checking out the manuscript in a poet's hands, filtering out the busy background laughter, tap-tap-tap, a photographer hopes for a moment's eye contact. 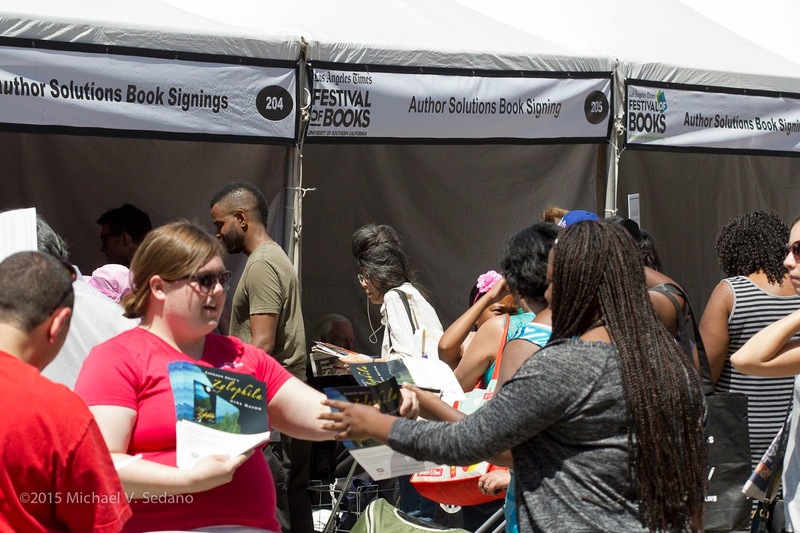 2016 marks the 21st year of the LA Times Festival of Books. Authors jumping on the self-publishing train, publishers seeking to make their mark on the publishing world, readers looking forward to the stage or the lounge know what worked this year and will likely keep those, or seek them out again. Other stuff has to be changed. As someone saddened at thoughts of people throwing away eleven hundred dollars to sit in a booth and watch the world go by, I hope next year's booth-buyers, self-published authors, independent presses and book sellers can get a lot more out of it. 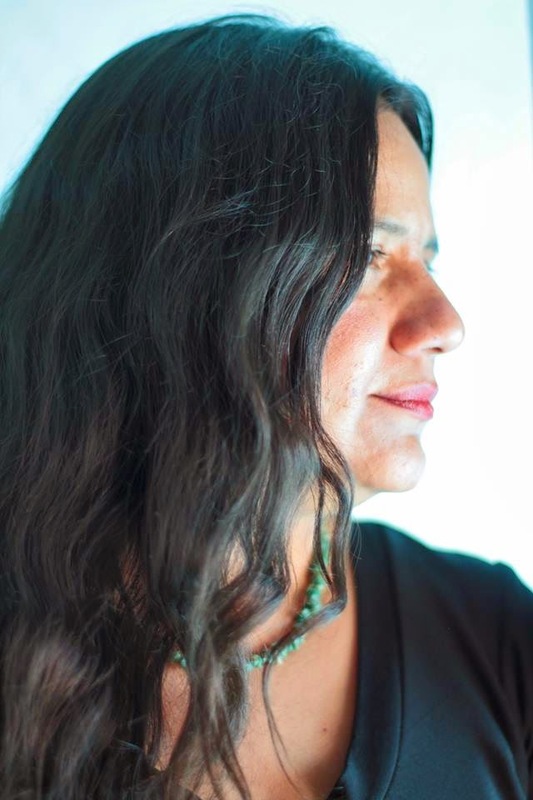 Chicano publishing takes another giant step as publishing house Aztlán Libre Press issues its first title in a hardbound edition, San Antonio Poet Laureate Laurie Ann Guerrero's A Crown for Gumecindo. Joining the efforts of Guerrero are California artist Maceo Montoya and an introduction by Tim Z. Hernandez. Aztlán Libre Press, together with sponsorship from the City of San Antonio Department for Culture & Creative Development, Gemini Ink, Southwest School of Art, plans a May 6, 2015 Launch Celebration in SanAnto. Email the editors for more information editors@aztlanlibrepress.com. In advance of the opening, when Guerrero will read from and sign her book, you can order A Crown for Gumecindo via Small Press Distribution at www.spdbooks.org and publisher-direct at www.aztlanlibrepress.com. This year’s Gigi Gaucher-Morales Memorial Conference will draw attention to the work of Mexican writer Mariano Azuela (1873-1952) and the Novel of the Mexican Revolution, a narrative cycle Azuela initiated with the publication of his novel Los de abajo (The Underdogs, 1915). 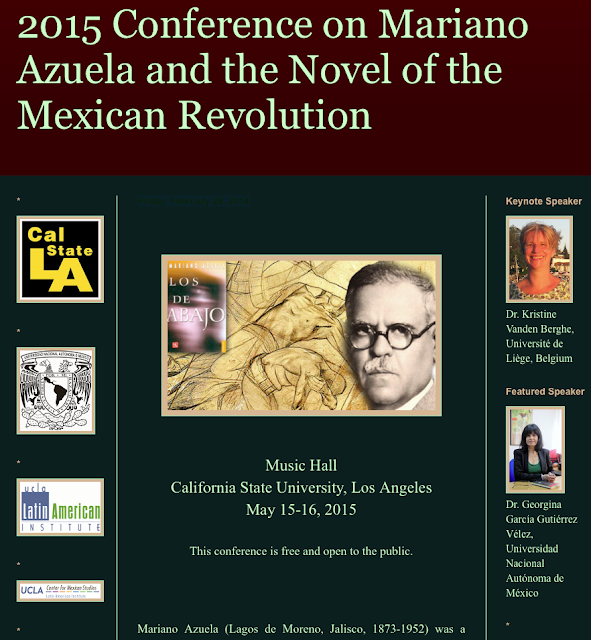 Six sessions focus on novels by Mexican writers Mariano Azuela, Nellie Campobello, Martín Luis Guzmán, Juan Rulfo, and Carlos Fuentes. Keynote speaker: Dr. Kristine Vanden Berghe (Université de Liège, Belgium). 1. Dr. Georgina García Gutiérrez Vélez (Universidad Nacional Autónoma de México). 2. Heribert von Feilitzsch (Historian, German-Mexican Diplomatic Relations). 3. 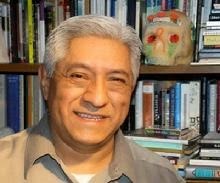 Chicano writer Michael Nava to speak on his novel The City of Palaces. 4. Dr. Florence Olivier (Université Sorbonne Nourvelle Paris 3, France). 5. 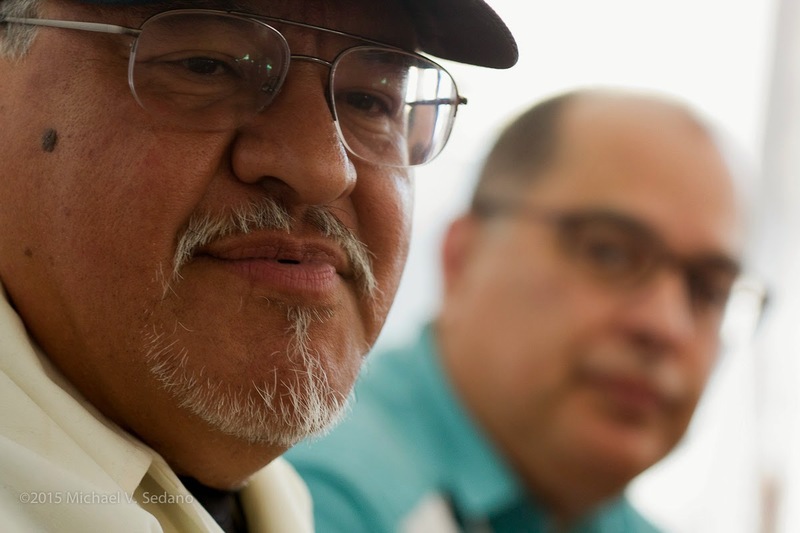 Chicano historian Dr. Max Parra (University of California, San Diego). 6. Dr. Niamh Thornton (University of Liverpool, United Kingdom). 7. Dr. Maarten Van Delden (University of California, Los Angeles). A theatrical adaptation of Los de abajo with performances by Mexican actress Alejandra Flores, and a cast of six professional actors and four Cal State L.A. Alumni. When the government of Mexico disappeared the 43 normalistas, it was the crime that people refused to ignore. Such an enormous crime brought gente en masse into the streets, and caravans of parents into the United States. Neither the parents nor conscienticized people the world over will let go of the anger. 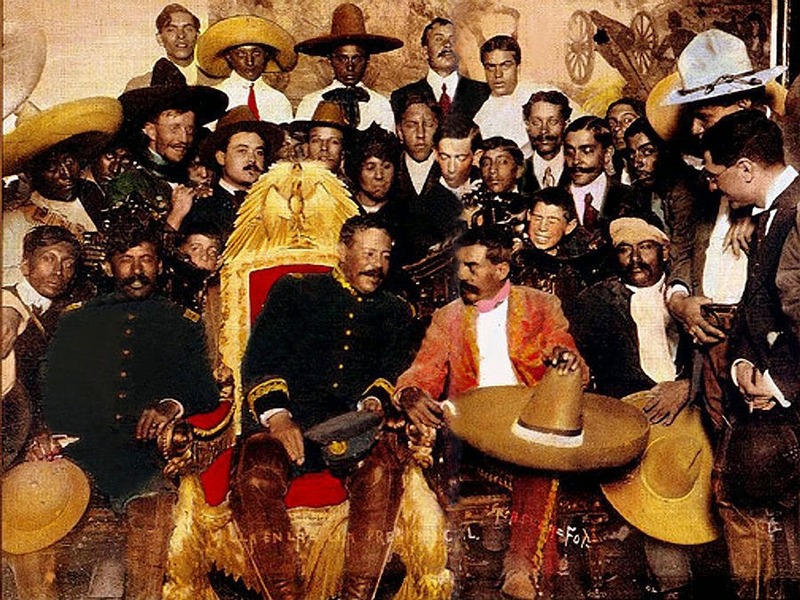 One day, historians will point to the tragedy of los 43 as one of the major causes of the Mexican Revolution of 2015 or 2016. How much government criminality can the gente take before they explode? La Bloga friend Abel Salas, with editing by bloguera Xánath Caraza, composed this poem to keep alive the memory and determination of the rallying cry, ¡vivos los llevaron, vivos los queremos! ¿Cómo se dice que estamos hartos? Presidente? ¿Te amarraron la lengua? I'm looking forward to an early morning walkabout in DTLA on Friday, May 1. I'm a volunteer at the check-in table for teams reporting for the middle day of the three-day Classic Slam event scheduled for the Los Angeles Theatre Center on Spring Street, East of Broadway. Visit the GetLit website for details. My name is Tom Sheldon and my work has been shown in local galleries, as well as the Museum of Natural History here. I have won art competitions at the State Fair level. I also love to write poetry; my poetry has been featured in La Bloga, Monique's Passions e-magazine, Poets Responding to SB1070 on Facebook, as well as Dreams and Divinities 2013 along with Writers in the Storm. Copyright © 2015 Sharon Elliott. All Rights Reserved. 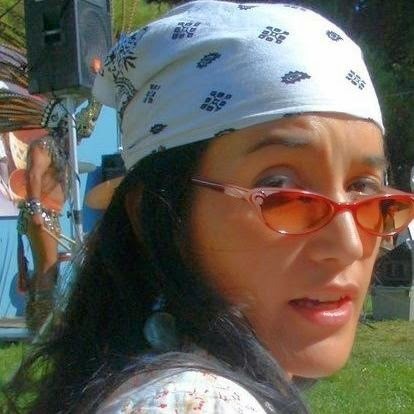 She has featured in poetry readings in the San Francisco Bay area: Poetry Express, Berkeley, CA in 2012 and La Palabra Musical, Berkeley, CA in 2013.
because WE want to be free! Searing planes of lasting melancholy inhabit the poet's mind, and the words must flow - if at least to help us all to repudiate this world's poison, to mend hope, to raise our will. 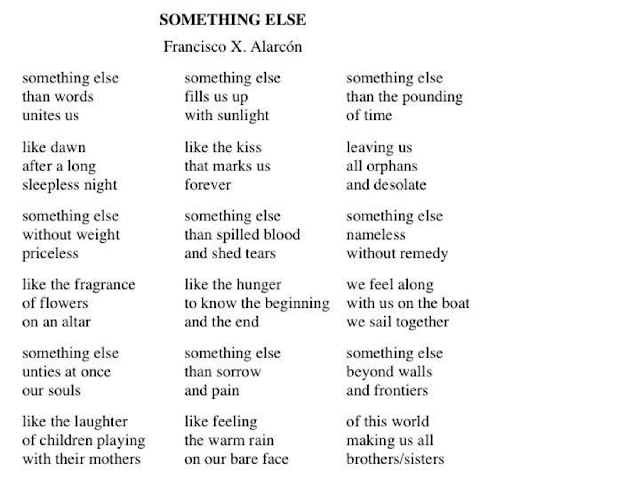 These searing planes of lasting melancholy that inhabit the poet's mind, also inhabited Cesar Chavez' mind. Worn, scorched, torn, chafed, broken. Yes, the searing planes of lasting melancholy inhabit the poet's mind. I write no poetry about this subject. The poetry is already written. Cesar Chavez' actions wrote it. Lives in our own deeds. in corporate vs. middle class income. because the art and poetry of the NEW artists is alive. .... because we are all alive. WE are here. if we want them to be. - truth, peace, and prosperity for ALL. 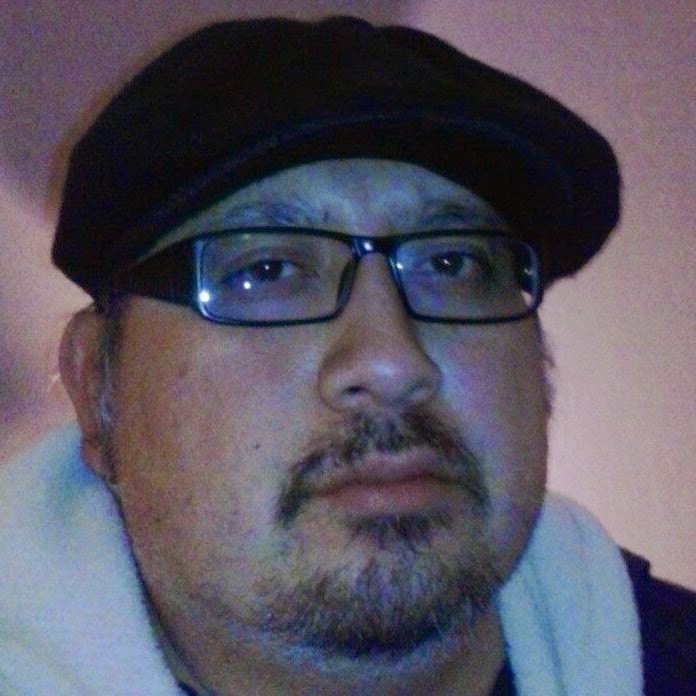 Paul Aponte is a Chicano poet from Sacramento, California. Paul, is a member of "Escritores del Nuevo Sol", and can be seen reading at various venues throughout the SF Bay and Sacramento areas. He is the author of the book of poetry "Expression Obsession" , and has been published in "La Bloga" and in other international publications. Many of his poems can be found on his Facebook "Notes" under the pseudonym Wolf Fox. paid for by your tax dollars. We do not fund education. Who will fill our prisons? We have a quota to keep. The uneducated are a necessity in Arizona. We need to protect the southern border. place them in makeshift concentration camps.. Prisons are good for the economy. Education is a poison that destroys the economy. They are trying to overthrow the government. Those little boogers are a threat to our ‘American ways. Here in Arizona we ban books that are against the American way. “Bless Me Ultima” is the Mexicans “Art of War”. We have to pasteurize and homogenize all of your minds. Our biggest investment is to the future and well being of Arizona. Prisons are big business and there is a lot of meat on the bone. A child that does not know how to read is a passive child. We should not even teach them to count. Keep them ignorant and uneducated. We will just keep building more prisons and raking in the cash. In Arizona we have a great business model. we will have your best interests in mind. 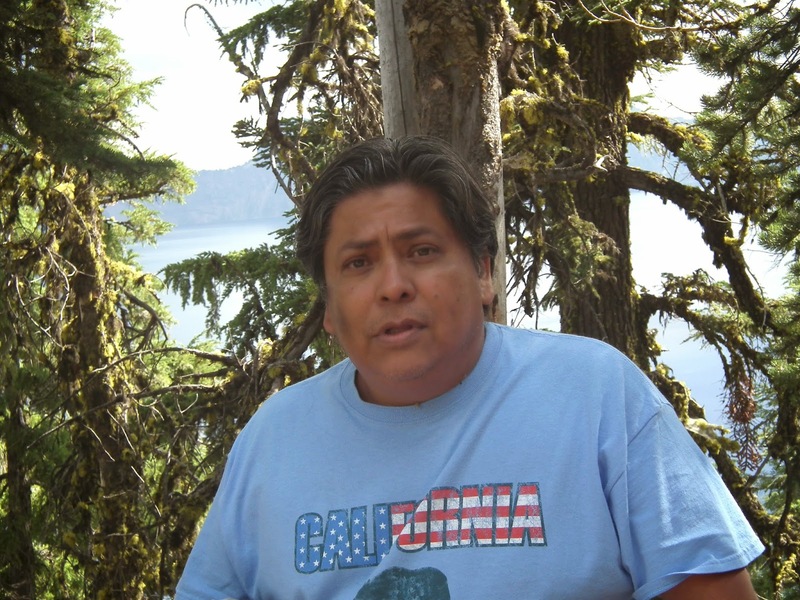 J. Armando Guzman is from the border town of Nogales, Arizona and has one chapbook published. 60 Miles From Heroica was published in 2014. Armando grew up in between Mexico and Southern Arizona. 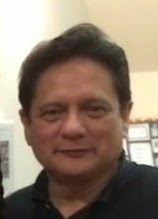 He is currently working on more poetry and flash fiction. Contact www.facebook.com/guzmanarmjoe or sanchomando@gmail.com. Jolaoso Pretty Thunder is an initiated Apetebi and Orisa priestess of Oya in the Lukumi tradition. She lives in the woods of Northern California with her two dogs Rosie Farstar and Ilumina Holydog. She is a certified practitioner and student of herbal medicine (Western, Vedic, TMC and Lukumi) and is an ordained minister of First Nations Church. 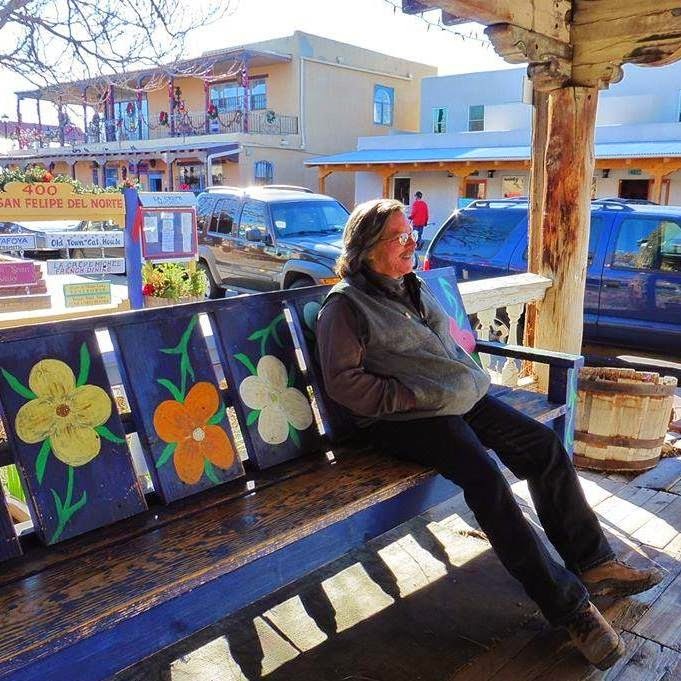 She is a well traveled poet and loves southern rock, porch swings, pickup trucks, cooking, camp fires, lightning, steak, long drives, hot cups of coffee, gathering and making medicine and singing with her friends and family. My name is Jorge Salas. I was born in Michoacán, México but raised in Salinas, California since I was 9 yrs old. I started writing verses when I was a boy. My skills improved after I read great writers like Pablo Neruda, Octavio Paz, Jorge Luis Borges, Carlos Fuentes, Gabriel García Márquez, among others. I attended Macalester College and earned a double major in Spanish Language and Literature and Studio Art in 1991. My learning continued at Colorado State University where I earned a Masters degree in Spanish Language and Literature. 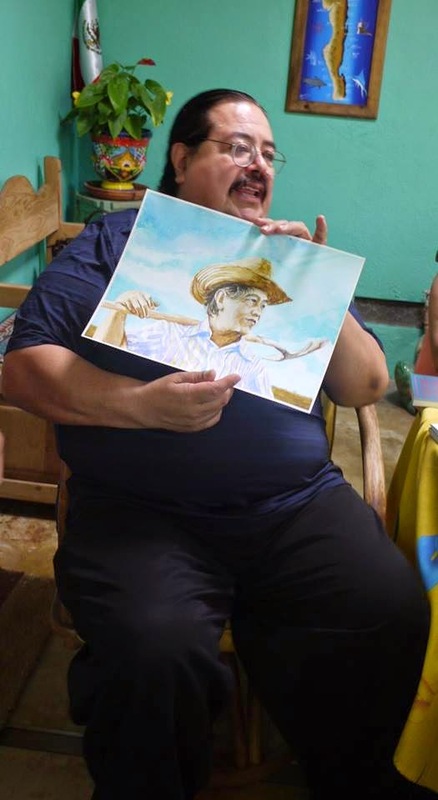 There, I explored my cultural identity in the US through writers like Lalo Delgado, Gloria Anzaldúa, Lucha Corpi, José Montoya, José A. Burciaga, etc. I am presently working on my 17th year as a high school Spanish teacher. I love reading and writing poetry, short story, and novels, but my passion is seeing my students get excited about writers they can connect with. Sweet is the rose in all her sweat when she dances. Sweet is the drummer when all he wants are romances. Sweet and redeeming is the thunder and lightning that comes from the God, Chango! I hear there is a sweet, sweet, sweet rain coming tonight. I shall wear my pretty dress and undress. This world needs more sweetness. Sweet is the life of the Hathors. I once knew a queen by that name. She was irresponsible in her spontaneity. I have always been the accused. I lay quietly in my sleep waiting for the sweet finger to caress me. When I was on Planet of the Apes, the apes treated their women with sweetness. I think that is what we need now. We need some kindness to infiltrate the universe and plant a love bomb. Sweet is the truth and sometimes the lie. Sweet is the God who wears a disguise to seduce his mortal women. Most of what ails us is the patriarchy. They replaced sweetness with violence. We die of hunger now and are whipped in the process. When I was a Jesuit, I wrote my novels in the woods. I chopped wood and carried water and sweet was my soul. I now have a thing for candles. A good fire heals me too. When I was a child, I dreamed of being an adult. When I became an adult, I dreamed of being wise. Now I drink my water with some wine. Little is left to say, only, there is a sweetness in that line I just made. And, sweet are the worlds that course through my mind. Sweet is the keyboard and the nonchalant mystic woman before it. I have been accosted to no end by the divine. The angels are keeping track of me. Oh-oh, life is so good that I think trouble is coming. How sweet to have a strong faith. When I was younger, I had it, and I gave it to all. Nowadays, I end my poems with thunder and lightning. Nowadays, I end the dance with a Gypsy pose. Soon, I will be receiving love letters. I hear it on the radio and on the news. I hear there is an emancipation by those who have been abused. Mother Earth has her enlightenment grid. Father Sky has his nymphs. I am available for seduction. But I don’t want to leave the earth that bore me. I kiss her with my tears. And, I drown myself in her waters. Jackie Lopez is a historian that has come to the conclusion that there are no words to place in context the tumultuous life she leads. 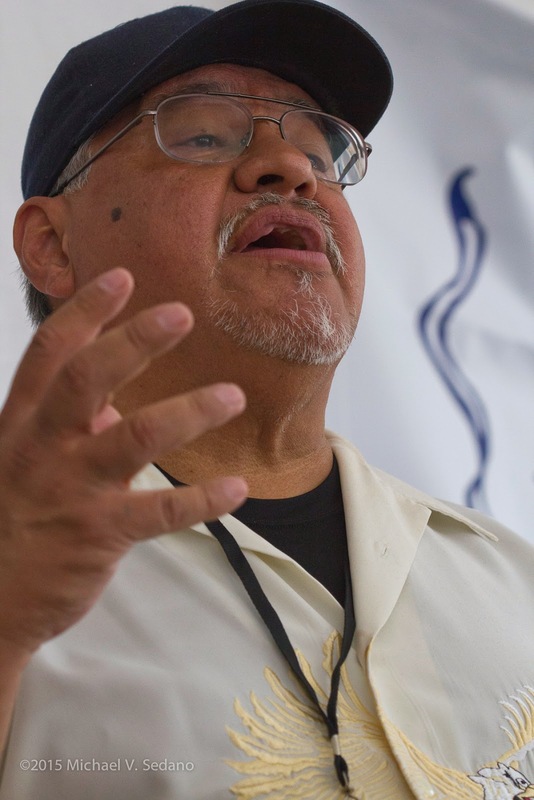 At first, you see a distinguished figure who makes a lot of noise about history, social justice, healing, and all sorts of shamanism in San Diego‘s cultural centers. At heart, she is a dancer and a poet that does not let go of the fact that she is transcendental meditation. When I ask her what she would tell the people; all she answers is that it is in the soul where the healing lies. Her aim is to plant seeds of enlightenment personality. 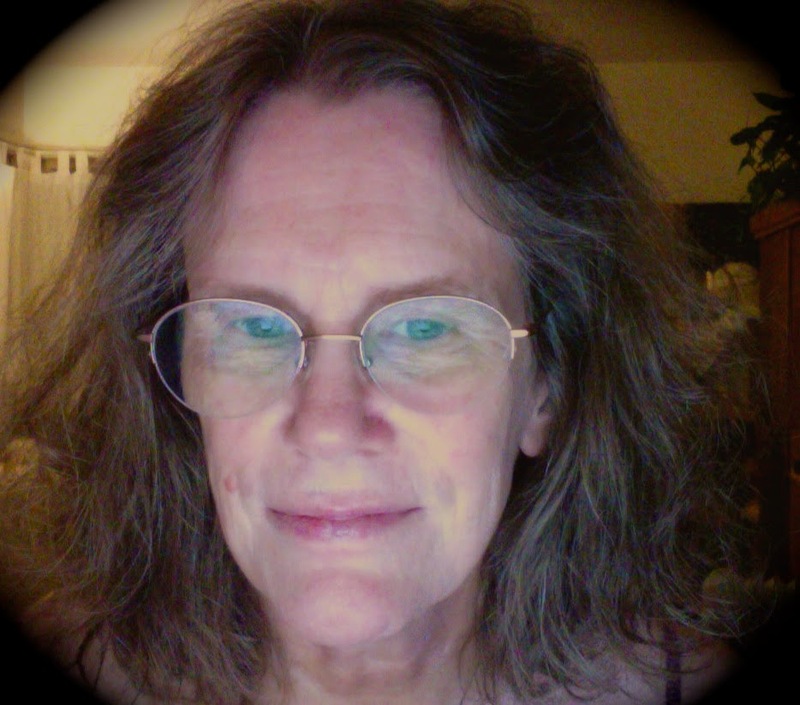 She claims that her poetry is beneficial to humankind because it awakens the “I am” process. Recently, she has written a 120 page poem and is seeking a publisher for this. Her poems have been published by Panhandler Productions, Warren College Literary Journal (UCSD) “The Hummingbird Review“, and Poets Responding to SB1070 face book page, Kill Radio, and soon in the “North American Review.” She can be contacted via email at: peacemarisolbeautiful@yahoo.com, day and night. así conoceré el dolor de mi pueblo. porque estás presente en cada persona. sólo así, seré libre al fin. porque en la entrega hay vida verdadera. para que yo pueda trabajar junto con otros trabajadores. para que se eleve el espíritu entre nosotros. para que no nos cansemos de la lucha. porque a nosotros han entregado la vida. así podremos cambiar el mundo. thus I will know my people's plight. for in surrender is there truly life. thus we can change the world. 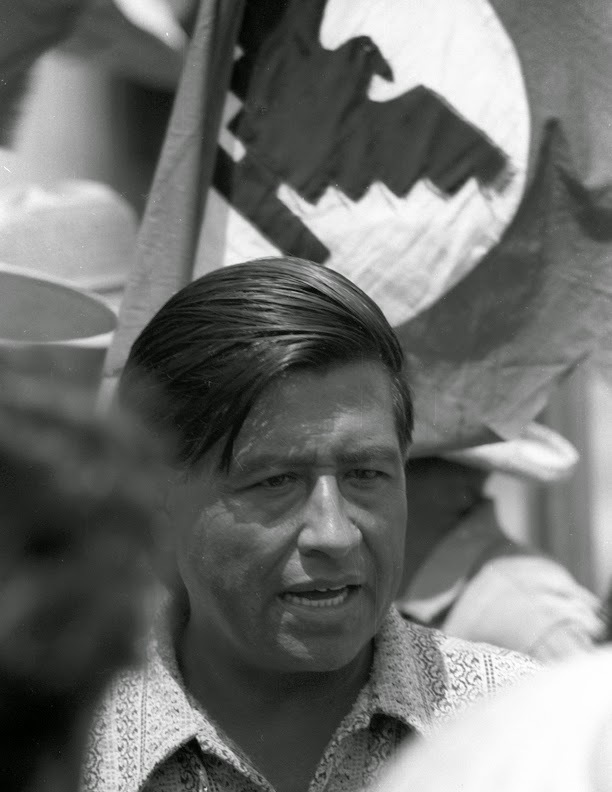 Cesar E. Chavez (1927-1993) is a United States labor movement hero. Has A Decade Already Passed? 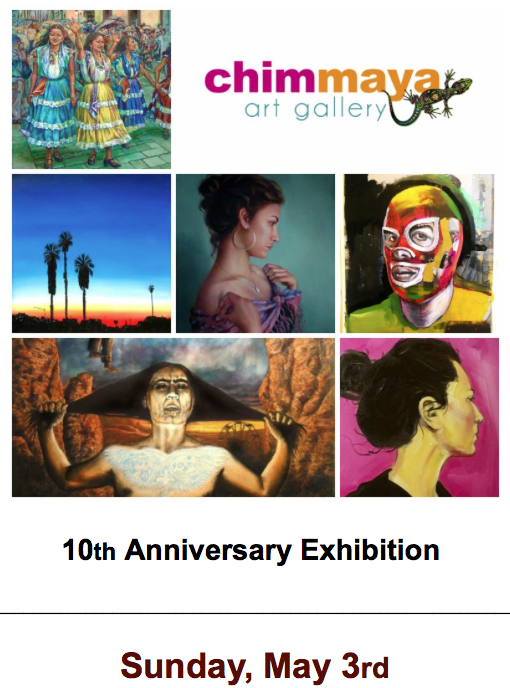 A short stroll from the Gold Line terminus brings you to one of LA's topmost galleries for local and raza art, Chimmaya Art Gallery. The gallery's openings invariably draw a who's who of artists, collectors, and if-only-I-had-money art lovers. The snacks are always outstanding, by the way. Drivers will be pleased finding next-door and near-by parking, even if they don't bring their own hyphens. Don't do CPT to avoid longer walks along Beverly Boulevard or environs. Chimmaya hosts book releases and stocks its boutique with in-demand purses, jewelry, and garments. 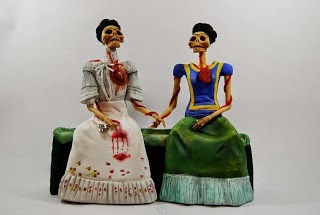 The gallery represents notable painters and sculptors, like Las 2 Fridas featured in Olga García's August 2010 column. I'd missed this show, but thanks to bloguera Olga, I rushed down to Chimmaya and added this one to my collection. Mil Gracias, Em Sedano for a brilliant, incisive,thorough post for today Tuesday April 21, 2015. Your wonderfully detailed review of the bookfest feels like doomsday for the printed word and a wake up call for book writers and poets to up their tactics, need to be more engaging, interactive, connected. 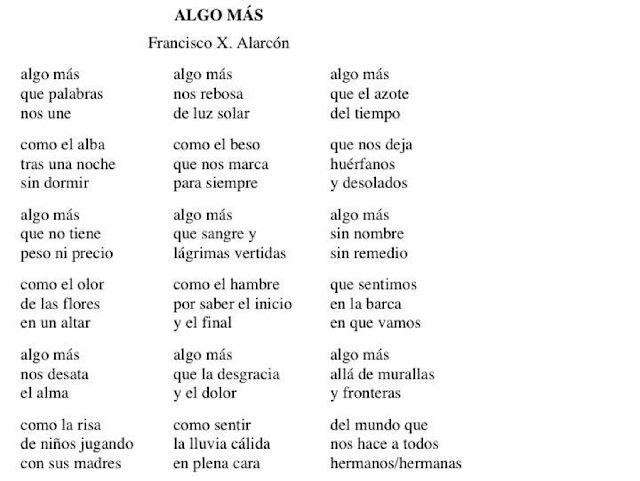 Viva la poesia! At least they lowered the costs because when I talked to Rubén Martínez way back then, they wanted $7k from him for the two booths he occupied. It became too much to bear when the book business was imploding all around them. Then they moved it to Southern Cal and there were barely any bookstores participating. It was mostly GM and other corporations with books as a side attraction (or excuse, if you will). I see that the Invisible Hand of the Market continues to rule what used to be a great event where I got to meet so many authors, heard great discussions ("I did not know that S. E. Hinton is a girl! "), bought so many books, and chatted with publishers. Thank you, Francisco, Jose, and jmu. It's ironic that when the bookfest moved to central city from a "people's school" the prices go down, along with cardiac arrest events. It's great, you westsiders need to give the eastside the look-see.